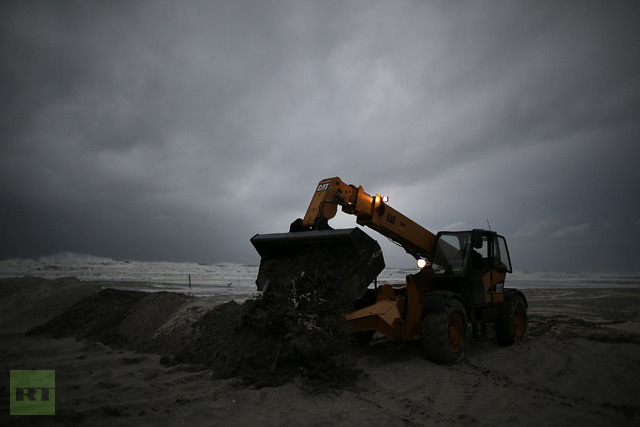 Sandy has happened before, sort of. 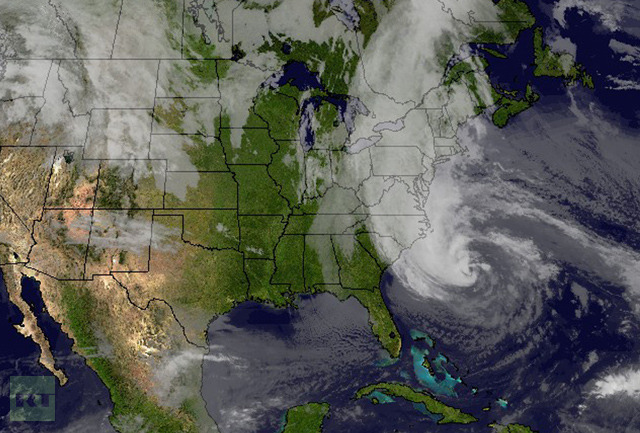 The Hurricane was named Sandy. It struck in October and took a path that brought it through northern New Jersey and New York State before the storm petered out over Canada. 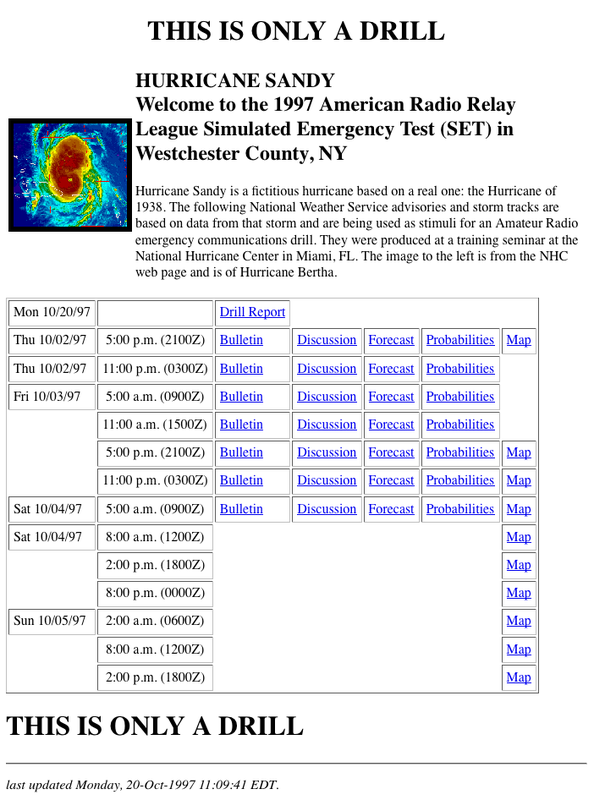 This Hurricane Sandy happened in the minds of members of the American Radio Relay League (ARRL) in Westchester County, New York, 15 years ago this month. 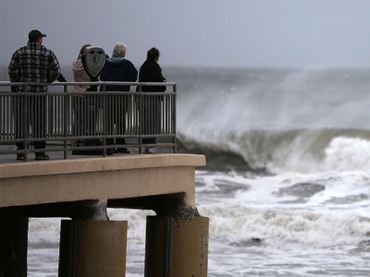 Hurricane Sandy is a fictitious hurricane based on a real one: the Hurricane of 1938. The following National Weather Service advisories and storm tracks are based on data from that storm and are being used as stimuli for an Amateur Radio emergency communications drill. They were produced at a training seminar at the National Hurricane Center in Miami, FL. 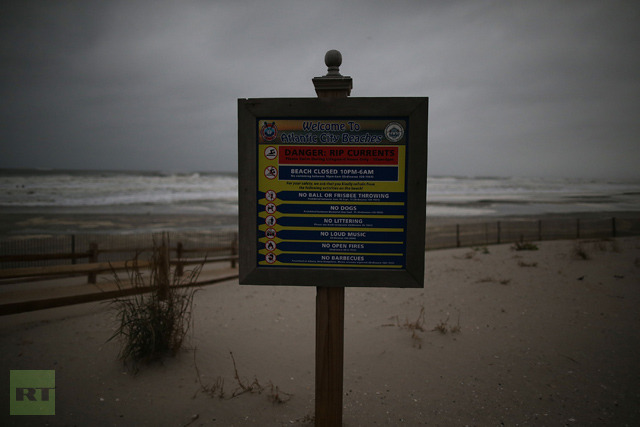 The first, fake Hurricane Sandy was an exercise for ham radio enthusiasts to practice relaying vital information should a situation identical to the real Hurricane Sandy ever occur, destroying more conventional lines of communication. SEABOARD…AT 5 AM EDT…0900Z…THE HURRICANE WARNING IS EXTENDED NORTHWARD TO ROCKLAND MAINE. A HURRICANE WARNING IS NOW IN EFFECT FROM CAPE LOOKOUT NORTH CAROLINA TO ROCKLAND MAINE. 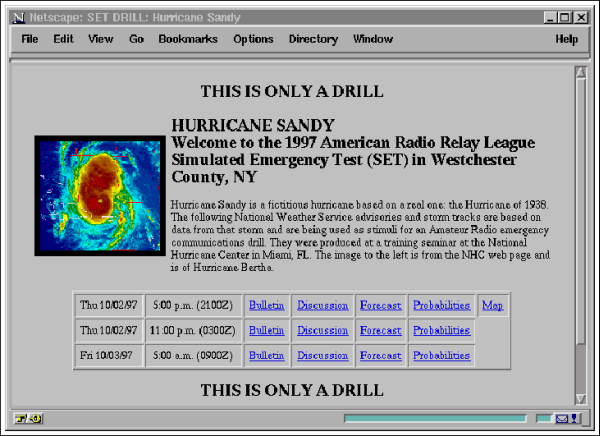 The ARRL drill involving Hurricane Sandy certainly seems strange now, but similar coincidences have occurred in the past. After the Titanic plummeted to the bottom of the North Atlantic in 1912, someone remembered that a little known author named Morgan Robertson had written a novel many years before that was eerily similar to the tragedy. 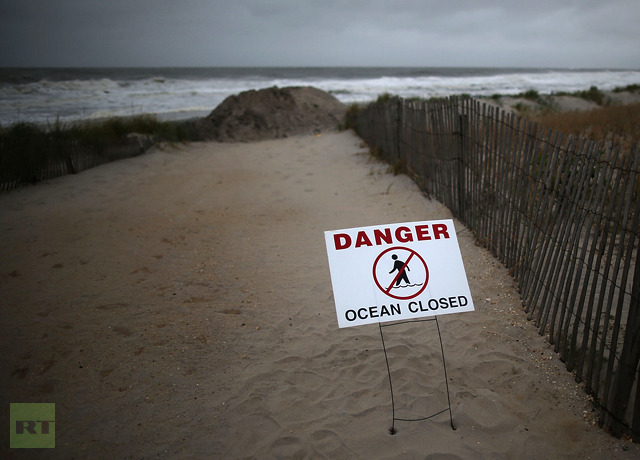 The Observer checked Internet Archive versions of the pages related to the fictional Hurricane Sandy to ensure this was not a hoax. They have been online and unchanged for a decade and a half. There is a river flowing very fast, it is so swift that there are those who will be afraid. They will try to hold on to the shore, they will feel like they are being torn apart and will suffer greatly. Know that the river has a destination. The elders say, we must let go of the shore, push off into the middle of the river and I say see who is in there with you and celebrate. At this time in history, we are to take nothing personally, least of all ourselves. For the moment we do, our spiritual growth comes to a halt. The time of the lone wolf is over. Gather yourselves together, banish the word ‘struggle’ from your attitude and vocabulary. All that we do now must be done in a sacred manner and in celebration. We are the ones we have been waiting for. Many who still practice traditional Hopi culture feel that the world’s axis is wobbling out of control, as the end of the current Fourth World approaches. This essay is excerpted from Robert Tindall and Susana Bustos, Ph.D.’s forthcoming book, Awakening Our Indigenous Mind, available from Inner Traditions. Between the underground kivas of the Hopi and the astronomical temples of the Maya where prophecy of world shaking events were received in ancient times, and contemporary apocalyptic fantasies such as the film 2012, lies a vast distance. Yet somehow those indigenous visions have migrated through the time depths to ignite our contemporary imagination, poised as we appear to be on the edge of their fulfillment. Perhaps this is because, like other beings of myth, prophecy roams from mind to mind. One of the further flung components of a culture’s cosmovision (or what we call, from a safe distance, a mythological system), prophecy arises from a confluence of visions, dreams, trance-states, and artistic inspiration. It is also, like a dream, curiously elusive to pin down – official, priestly versions may eventually be engraved upon calendrical stones at the feet of pyramids and jungle astronomical observatories, but only after the prophecy has simmered among the people, in many local variations, for many passing moons. In addition, I suspect prophecy only becomes truly relevant when heard. Prophecy is not a fact. Rather, it is a thing received, taken to heart so it catalyzes change in one’s life. Like cosmovision, prophecy may lose its savor when written down. It becomes an official version, an object of critique, something true or false in a factual sense, or an object of veneration. Yet prophecy is not a fact – it is a living current, like the sap that flows through the veins of leaves. In constant evolution, there is no orthodox version. The stream continues to flow through Hopi kivas and other sacred sites. I therefore never paid serious attention to the buzz generated around 2012. After all, documents are always open to interpretation, facts shift their meaning according to methodology, and like the children’s game of telephone, transmission over distance is fraught with error. We have the earth under our feet, its plants and animals and waters, and the stars above us to show us the way. What subtler prophecy could we be privy too? Then one day, like music, I heard the Hopi prophecy. It came one voice removed from its source, in the person of Bob Boyll, a 75 year old roadman, or peyote shaman, in the Native American Church who has passed many years among the indigenous communities of the U.S. and Mexico. I first met Boyll, whose ancestry is Scots-Irish and Native American, upon stepping through the flap of a tipi where a peyote meeting was about to commence. A stocky man with grey hair held back in a ponytail, he greeted me with an abstracted, kindly air. Thinking, “Ah, he’s a cool old hippy,” I went to occupy my seat. This was my first tipi meeting, and that evening I had the privilege of beholding the keeping of a sacred fireplace, which it turned out Boyll, in the office of fireman, was assisting the roadman (as the leaders in Native American Church ceremonies are called), in keeping. At some point as my visions and dreams danced in the fireplace, I became aware that the old man wading through the coals was working a kind of alchemy. Boyll’s hands seemed to commune with the fire, to transmute it, like an ancient Celtic god of blacksmithry, into something magical. In the morning, when he talked about the various intelligences – beings, actually – perceivable within the flames of the fire, I realized that Boyll had, as they say, seriously done his homework. As part of Boyll’s long apprenticeship in the indigenous ways of medicine work, he had sought instruction from the Hopi who live in the village of Hotevilla on Arizona’s First Mesa. The year was 1978, a time in his life when he was seeking answers to questions his graduate program in philosophy at Colombia had not addressed, among which were the visionary abilities of the Hopi. 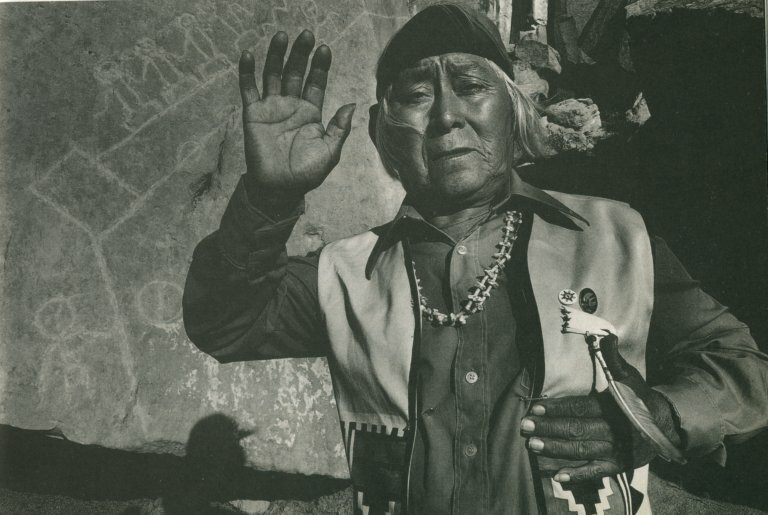 Astonished, Boyll was shown into the main room, where a hale and very old blind man sat, who embraced him, saying, “Oh grandson, you finally here!” The Hopi was named David Mononge, and his age was then estimated at 107. Mononge immediately inquired if Boyll had brought one of those recording machines, and being told yes, sent him back out to the car to retrieve it. Mononge had something to transmit, and wanted to make sure it got recorded accurately. That afternoon the elder Hopi sang for Boyll the butterfly Kachina song. “When you’re in ceremony I want you to sing this,” he explained, stating he was giving it to Boyll because as a song of unification it contained all the colors of the rainbow. “The time has come,” he said, “for a regathering of everyone, not just the Hopi, into unity.” Boyll now sings it in sweat lodges he leads throughout the U.S. and Europe. One afternoon during the week that Boyll passed with Mononge, the old man took him out to the Second Mesa, where one of the prophecy rocks of the Hopi, part of a sandstone cliff formation, rises 20 feet high covered with ancient carvings. The main petroglyph shows a figure representing the Earth guardian, Maasau’u, who welcomed the original humans, who for the Hopi emerged from under the earth and lived unified for many years under the covenant they made with him. In the hand of Maasau’u is a staff, from which emerges a square representing an original condition of wholeness. Eventually, however, discord arose and migrations took place away from the mesas. * From this square, therefore, embark two lines, which set off across the face of the stone as roads. Upon the upper line are human figures whose bodies progressively disintegrate, first with the loss of the solar plexus, and then with their heads drifting away from their bodies. These figures are known as the people of “two hearts,” signifying a state of spiritual disunity, and their road grows progressively jagged and then breaks, indicating disintegration, chaos. As has gripped the popular imagination, this is a period of geological upheaval and societal discord and collapse, but this emerging chaos is also called by the Hopi the “Great Purification,” pointing towards its spiritual significance. According to Mononge, whatever is not essential to our being, anything that draws the heart away from unity, will be consumed, and there will be an opportunity to return to the lower road of the petroglyph, the way of “one heart.” In fact, a “bridge” can be seen connecting the two roads during the time of Great Purification, during which a moment of opportunity will occur in each individual’s life when the passage will open to go from two-hearted to one-hearted, or vice-versa. 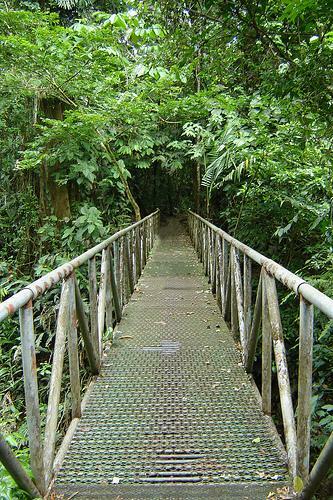 Once the bridge is traversed, however, there is no return. This lower road Mononge described as the way of those who know where they belong on Earth, and that they belong to the Earth. It is the way of those who have returned to their clans. The Hopi vision, it is worth noting, is the opposite of the Garden of Eden myth, which depicts our ancestors as cast out of the clan’s origin to wander in exile, unable to return to the original connection to the Garden because an angel with a flaming sword stands guard at the entrance to the sacred land. In the petroglyph, the road appears lined with stalks of corn and mounds and the leader of the path of the one heart is there, the figure of a man, holding a prayer stick in his hand, planting corn. It is a humble, yet very inviting image. If wisdom arises from such simple communion with the Earth, then the Hopi may be able to remind us of it. The prayer stick held in this figure’s hand was, and still is, used to plant corn in the desert. One might smile and say, it’s good to pray if you’re going to plant in such conditions. The Hopi would agree. So prayerful are they, they don’t irrigate their corn. They summon the rain instead. Boyll witnessed the Hopi’s intimate connection with their ecological system one day when he attended a dance to the Kachina spirits who govern the rainfall. According to Mononge, one of the signs of the approach of the Great Purification, and there are many, would be the desire of people to reform their clans. To Boyll, he said, “You’re still looking for your original home, but after all the migrations the time has come when your people can find where they belong.” Mononge, whose language has no verb to express the concept “to be,” meant something bigger than just physical locale. He meant belonging to the cosmos, which is expressed by a clan’s spiritual communion with its ancestors, sacred topography, medicines, animal allies, songs, origin myths, dreams and sacred art. even ways of growing food, treating water, or raising children, all those cultural practices that express a vital, living participation in a sentient world. When Boyll asked Mononge, “Grandfather, how did you know I was going to appear at your doorstep on the day I did?,” the old man explained to him that for the Hopi, transmigration occurs not individually but in clans, much as birds migrate not solo but in flocks. These soul groups come in and out of existence, and are attracted to one another, consciously or not, each time they come back into incarnation. Mononge also said that every sacred fire, kiva ceremony, or peyote meeting, that is to say, every time of collective transformation and evolution among the people, has an attendant spirit. This living being exists long before the event, containing and directing it, and is precognizant of what specific work needs to be done in each participating individual’s life. In a similar vein, these soul groups are pre-existing clans, who especially in the time of the Great Purification are called to find one another. This spiritually-directed regathering strongly suggests that the bridge between the roads of the two-hearted and one-hearted is the way from our collective identity with nation states and corporations (and their fascistic, suicidal tendencies) to individuated kinship within clans, clans who follow the leader of the path of one heart. This is, according to Mononge’s transmission to Boyll, the prophetic summons within the Hopi prophecy for us – to reawaken the indigenous mind, to rediscover our clans as the path of one heart through the coming Great Purification. * Among those who migrated were the ancestors of the European whites, who the Hopis say traveled until they came to a wall, upon which they knocked their foreheads four times and then turned around and headed back. “I’ve seen that wall!” Monongnoe declared, “It’s in Jerusalem,” evidently referring to the Wailing Wall. The anti-capitalist protesters who occupied St Paul’s Cathedral were both morally and intellectually right, a senior Bank of England official said last night. Andrew Haldane, a member of the Bank’s financial policy committee, said the Occupy movement was correct in its attack on the international financial system. 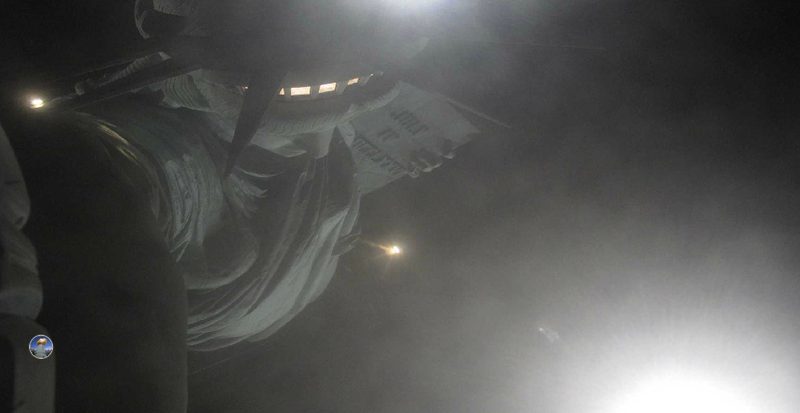 The Occupy movement sprang up last year and staged significant demonstrations in both the City of London and New York, protesting about the unequal distribution of wealth and the influence of the financial services industry. Members of the movement occupied the grounds of St Paul’s and remained camped there for more than three months until police evicted them in February last year. “Occupy has been successful in its efforts to popularise the problems of the global financial system for one very simple reason; they are right,” Mr Haldane said last night. Mr Haldane, the Bank’s executive director for financial stability, was speaking to Occupy Economics, an offshoot of the Occupy movement, at an event in central London. In a speech entitled Socially Useful Banking, he said the protesters had helped bring about a “reformation” in financial services and the way they are regulated. Partly because of the protests, he suggested, both bank executives and policymakers were persuaded that banks must behave in a more moral way, and take greater account of inequality in wider society. In the text of his speech distributed by the Bank last night, Mr Haldane made no reference to the techniques employed by the Occupy protesters. The occupation of St Paul’s last year was controversial, and led to claims that the protesters were despoiling the cathedral’s grounds. The protest ended after the Corporation of London won a legal order allowing the activists to be evicted. Earlier this month, members of the group marked the first anniversary of the St Paul’s protest by entering the cathedral during a service and chaining themselves to the pulpit. 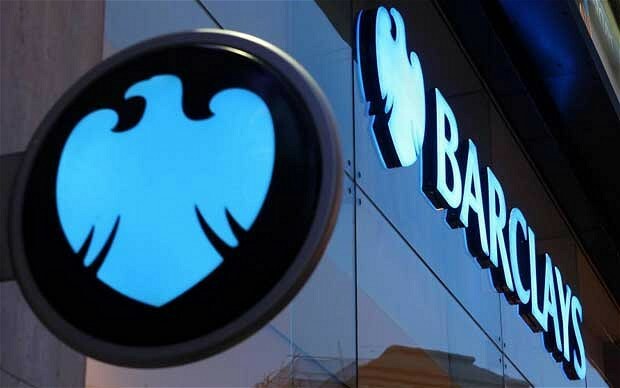 Barclays will be forced to disclose the names of staff involved in Libor rigging, following a damning court judgment over claims it mis-sold interest rate swaps to a care home operator. The bank was chastised on Monday at the High Court in London by Lord Justice Flaux, who claimed Barclays was intentionally trying to hide the true scale of the Libor scandal, which has already seen the lender fined £290m. The criticisms came as Barclays faced a preliminary hearing, ahead of a trial, over allegations it mis-sold to a care home group complex interest rate derivatives that were in turn based on false Libor rates. Issuing a damning judgment, Lord Justice Flaux said Barclays’ objections to the Libor-rigging claims brought against it by Guardian Care Homes were “wholly without merit” and accused the bank of “misleading” customers. Allowing the case to continue to trial, the judge described the bank’s attempts to dismiss the Libor aspects of the care home operator’s claim as “shadow boxing” and said they were “doomed to fail”. Guardian Care Homes’ lawsuit is seen as a test case for Libor-rigging claims and the court decision to allow the case to go to trial potentially opens the door to billions of pounds of legal actions against other banks involved in the rate-setting scandal. Over a day-long hearing, Lord Justice Flaux repeatedly struck down Barclays’ objections and said the bank would be forced to disclose potentially embarrassing details, such as the identities of staff implicated in Libor manipulation. “[It] just seems perfectly obvious… that the people responsible for giving those instructions [manipulate Libor] must have known customers were being misled,” he said. Tim Lord QC, representing Guardian Care Homes, which has more than 30 care homes around the country, told the hearing that disclosures so far from the bank were “likely to be the tip of the iceberg” and that the case went to “the heart of the management of Barclays”. “Barclays seeks to serve up its own version of the facts, a santised version,” said Mr Lord. Representing Barclays, Adrian Beltrami QC said the information asked for by Guardian Care Homes would have “signficant ramifications” and make the case “unmanageable”. However, Lord Justice Flaux rejected the arguments and said Barclays would from next month have to begin providing the names of staff involved in Libor-rigging to Guardian Care Homes’ legal team. “This is all shadow boxing. The real issue is they [Barclays] are trying to shut it down because they don’t like it,” he said. The Guardian Care Homes’ claims against Barclays over mis-sold swaps, designed to protect the company against rises in interest rates, amount to about £38m. It is alleged that Libor-rigging at Barclays inflated the cost of the swaps to the company. The care home group has already settled a similar swaps claim against Lloyds Banking Group for an undisclosed sum. (NaturalNews) The time for preparedness is over. 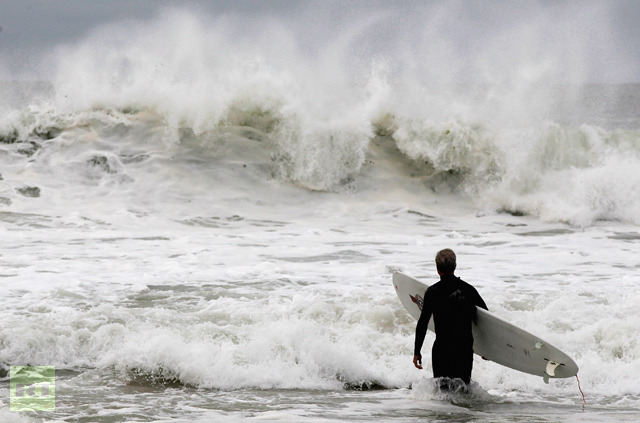 Now those who are in the path of Hurricane Sandy and the converging “superstorm” must hunker down, ride out the storm and stay focused on safety and survival. They need the blessings of all of us who are not in harm’s way, so today Natural News urges all our readers to say a prayer for those who are about to find themselves at ground zero. This is unusually blunt language from the National Weather Service. 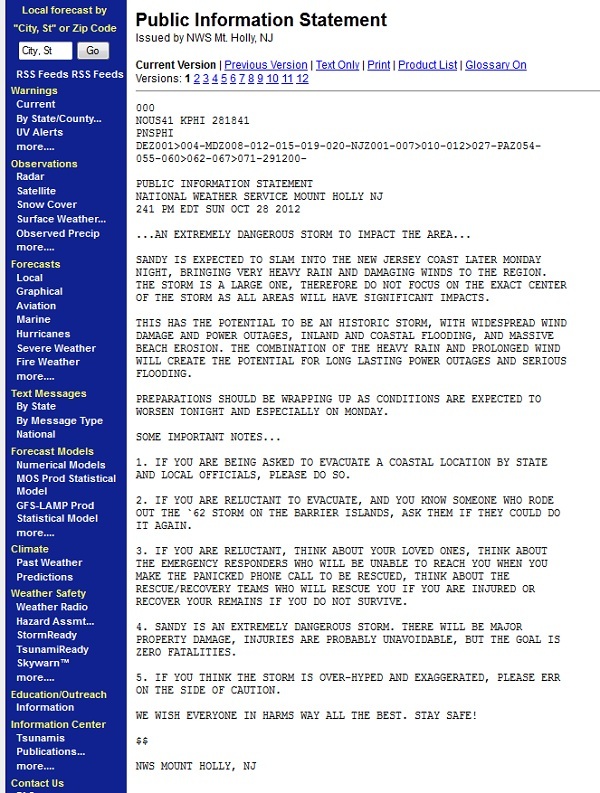 In fact, I don’t recall ever seeing NWS warnings with this kind of urgent language. My motto is: Prepare, then pray. Prayer cannot take the place of preparedness, of course. To sit around praying while doing nothing to take responsibility for your own preparedness is foolish. But prayer can help lend strength and courage to those who need it most. The scientific literature reveals many rigorously tested clinical trials showing that patients recover from surgery more quickly when others pray for them, even in a so-called “double-blind” test where those doing the praying have never met the person they’re praying for. The reason prayer works is because we are more than just physical beings. We are spiritual beings experiencing life through physical bodies, but our consciousness is non-physical and exists above and beyond our physical brain. This understanding, if fully embraced, would revolutionize our world and our civilization, because so much of the evil in this world today is based on the “materialism” view of science which says that humans are mere biological machines with no minds, no free will and no consciousness. The higher truth of the matter is that material things are only the beginning. We may at first appear to be made of matter, but our consciousness interfaces with our brains and bodies through a non-material pathway which has not yet been identified. When we pray, we broadcast a desirable outcome to the cosmos, and while we are not Gods and do not have the power to reshape worlds by merely wishing, we do have the power to subtly influence apparently “random” events, nudging them toward the direction of our desired outcome. This, too, has been well demonstrated in the scientific research. An outstanding book summarizing some of the non-material phenomena of which the mind is capable is Science and Psychic Phenomena: The Fall of the House of Skeptics by Chris Carter and Rupert Sheldrake. I also highly recommend Science Set Free by Sheldrake, an impressive thinker, writer and philosopher. Prayer is, after all, an appeal to a non-material consciousness to aid in achieving a more positive outcome. Even those who have been lifelong skeptics of prayer are instantly transformed into true believers the moment they experience it themselves. Read the astonishing book Proof of Heaven: A Neurosurgeon’s Journey into the Afterlife by Eben Alexander, M.D. You will be absolutely enthralled by the journey of this brain surgeon from hard-core skeptic to passionate believer. The simple truth is that the power of prayer is real. It works because there’s more to us than just our physical bodies and brains. We are beings of immense energy and light, capable of achieving great things not just with our hands but also with our minds. Our entire universe, I believe, is but one of an infinite number of other realms brought into existence by our Creator — a highly advanced consciousness which has been given a thousand different names throughout human history but which ultimately stands for the same unified concept: LOVE is the fabric of the cosmos, and through prayer, or meditation, or even just practicing gratitude, we can broadcast love to those who need it most. 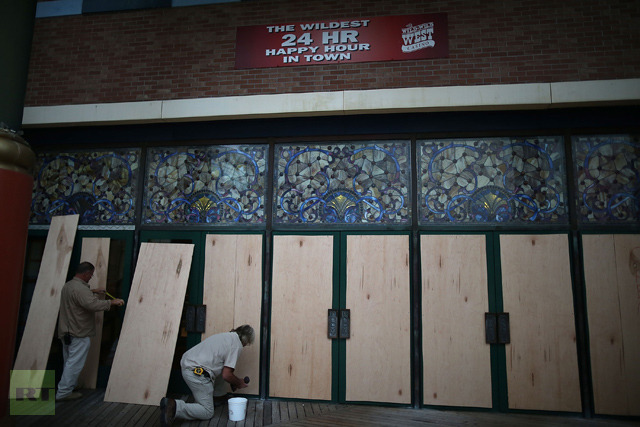 Today, the people in the path of Hurricane Sandy are in need for our prayers and our support. May they find safety and comfort during this difficult time, and may they emerge from this test with a greater appreciation for life and all that it offers. While hurricanes may destroy material things, the experience of surviving one can only strengthen that part of us which is not material: our souls. All of these moves are…(Please support the WDS by subscribing or, if you cannot afford to, get yourself on the free e-mailing list, thank you)…signs of intensified power jockeying in the run up to planned government changes this fall in the US, China, South Korea, Japan and elsewhere. The Nazis under Bush are insisting that their man Romney be put in power during the November 6 (not 8 as erroneously reported by this newsletter on previous occasions) “election” or else they will wreak steadily intensifying havoc. Other threats believed to be connected to the Nazis include a warning to hit Geneva with a tsunami caused by a landslide and to hit the US West coast with a mega-earthquake. They have targeted the North East of the US with a storm as a show of power and as a sign of their opposition to the Eastern establishment and their man Obama, the Pentagon source says. Of course neither Obama nor Romney has more than 15% support in the real world (as opposed to the Stalinist “polls”), making it a perfect time for an independent candidate like Ron Paul to kick both bums out. Some of the Nazi demands were hand delivered to this writer in a letter written by a person believed to have been close to post-war Nazi Fuehrer Admiral Canaris. 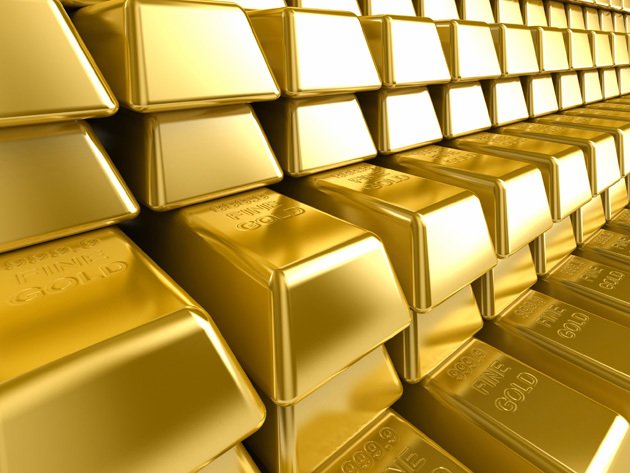 The main demand of the letter is to allow the free energy technology to be released to the people of the planet. Free energy, if used for constructive purposes, would allow for an era of unprecedented growth and prosperity for the planet and the WDS has always supported it. The problem is in that years of research on this subject, nobody has been able to show this writer personally an actual working free energy device. If the Nazis have free energy technology they should just go ahead and release it. Of course the existing energy industry accounts for a huge percentage (some estimate as high as 70%) of global economic activity and a smooth transition to the new technology (if it really exists) is recommended to prevent chaos and major possible social disruption. The BIS source, for his part, said the Western elite still wanted a World War in order to rid the world of two-thirds of its population prior to setting up a world government according to a 1973 Club of Rome plan. 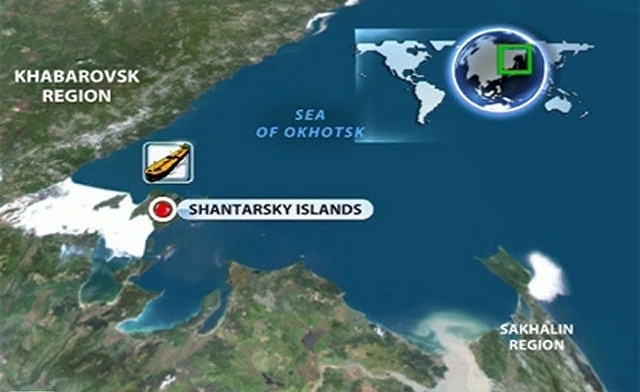 The map in the link above shows the end game of the BIS led group, this source said. The titular head of the BIS is Ben Bernanke. This BIS source also said the US Federal Reserve Board was already being shut down and that all its powers and staff were being transferred to the US Treasury Department. There was also a hint that vast funds would start to flow towards the WDS if it went along with the program. Of course since the US is no longer a democracy, transferring Fed powers to the Treasury at this point is a bit like changing the titles on the name cards but leaving the usual suspects in charge. The Asian power brokers who approached the WDS representative in Indonesia last week were more of the mind to replace the entire top management of the planet and bring in new blood with new ideas. Certainly a lot of us wonder why a bunch of 80 and 90 year olds who seem to have secret access to life prolonging medicine (denied to the rest of us), should be allowed to remain in charge. The general impression from the flurry of contacts and threats last week is that there are now three main factions battling for control of the future of this planet. One is the committee of 300 with the Pope and Queen Elizabeth pushing for Obama, the other is the Nazis under Bush et al pushing for Romney and the third is us peasants who just want these murderous power games to be replaced with love and friendship. If the elite try to again use mass murder and terror to control the poor, they and their extended families will be systematically hunted down and slaughtered. The average person does everything possible to avoid violent confrontation but when you try to kill their families and loved ones, their righteous fury is unstoppable. The general understanding of the WDS and its allies, though, is that we have a clear choice between a win-win solution for everybody and a lose-lose solution for everybody. War and terror is a two-way street, so is love and friendship. The world will not end. It will be transformed. — Mayan elders. 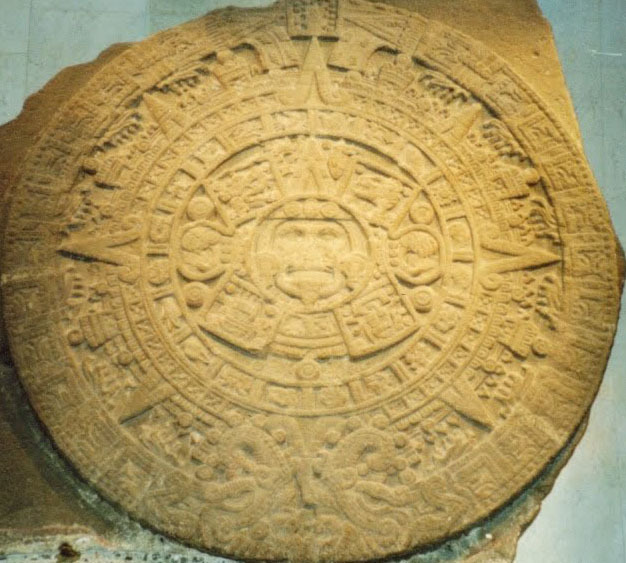 For years the Mayans have been fighting against the doomsday myth surrounding the incorrect reading of their ancient calendar. As the date of December 21, 2012 approaches the hype has caused an increasing amount of distress for the indigenous Mayan people, especially with their homeland in Guatemala being turned into a cheap tourist attraction for the coming “apocalypse”. Just this week, Guatemala’s Mayan people accused the government and state sponsored tour groups of perpetuating the myth that their calendar predicts the end of the world, so they can benefit financially from tourist revenue. The Culture Ministry of Guatemala is hosting a massive event in Guatemala City, which as many as 90,000 people are expected to attend, all being promoted under the pretext of a “doomsday” celebration. Felipe Gomez, leader of the Maya alliance Oxlaljuj Ajpop protested this week with other Mayans, urging the Tourism Institute to rethink the doomsday celebration, which he criticized as a “show” that was disrespectful to Mayan culture. “We are speaking out against deceit, lies and twisting of the truth, and turning us into folklore-for-profit. They are not telling the truth about time cycles” Gomez told the AFP news agency. As the Mayans believe, and as many modern researchers also believe, the human species has already went through many different changes during their history on the planet earth. Those changes have many times been difficult, but have also been followed by rapid leaps in understanding, compassion and social advancement. As I discussed in my book Alchemy of the Modern Renaissance “The doomsday theory is unlikely and overused by power hungry governments that wish to keep their populations in fear. As we have seen quite recently in the past decade in the United States, the establishment constantly uses fear to manipulate the minds of US citizens. This technique is not new either, it has been used for centuries whether it be the fear of economic collapse, natural disaster, the enemy, or the fear of god, fear has been used by the few to dominate the many for ages. The end of the world has been predicted many times and has yet to come, the last time that this kind of hysteria swept the world was just over a decade ago, around the change of the millennium with the y2k scare. The world didn’t end last time, and it is not going to end next time. However, there may be some truth that we are on the verge of some sort of societal transition, looking around the world all of the signs are certainly there. Oxlajuj Ajpop is holding events it considers sacred in five cities to mark the event and Gomez said the Culture Ministry would be wise to throw its support behind their real celebrations. However, there it is not likely that the government tourist agency and the ministry will change their course. J.G. Vibes is the author of an 87 chapter counter culture textbook called Alchemy of the Modern Renaissance, a staff writer and reporter for The Intel Hub and host of a show called Voluntary Hippie Radio. He is also an artist with an established record label and event promotion company that hosts politically charged music events. You can keep up with his work, which includes free podcasts, free e-books & free audiobooks at his website www.aotmr.com .